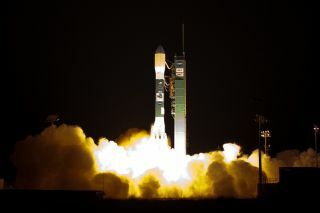 A Delta 2 rocket launches with the NPOESS Preparatory Project (NPP) spacecraft payload from Space Launch Complex 2 at Vandenberg Air Force Base, Calif. on Friday, Oct. 28, 2011. NPP is the first NASA satellite mission to address the challenge of acquiring a wide range of land, ocean, and atmospheric measurements for Earth system science while simultaneously preparing to address operational requirements for weather forecasting. The launch of NASA's newest Earth-observing spacecraft today (Oct. 28) could not have gone more smoothly, researchers and officials said. The $1.5 billion NPP weather and climate satellite blazed a white-hot trail through the predawn California sky this morning, ticking off milestones like clockwork as it climbed. The spacecraft separated from its Delta 2 rocket right on time, and its power-generating solar panels deployed on schedule as well, mission managers said. All in all, it was "an absolutely perfect launch," NPP project scientist Jim Gleason, of NASA's Goddard Space Flight Center in Greenbelt, Md., said in a post-liftoff press conference. In 2009, for example, the $273 million Orbiting Carbon Observatory crashed into the ocean near Antarctica shortly after liftoff. And in March of this year, the $424 million Glory climate satellite plunged into the Pacific. Both of those missions used Taurus rockets, provided by the Virginia-based Orbital Sciences Corp. Both were doomed when the rocket's nose-cone fairing— a shell-like covering that protects its satellite payload — failed to open as designed. The ocean-monitoring Aquarius satellite, by contrast, reached orbit successfully in June 2011. Like NPP, Aquarius rode atop a Delta 2, provided by the United Launch Alliance. The white-knuckle moments are pretty much over for NPP, team members said, and they can now focus on the spacecraft's science mission, which is slated to last for at least five years. "Now, the future of NPP starts, and we look forward to NPP touching the rest of the world," said NPP project manager Ken Schwer, also of NASA Goddard. NPP — which stands for National polar-orbiting operational environmental satellite system Preparatory Project — is the first probe ever designed to collect data for both short-term weather forecasting and long-term climate monitoring, researchers have said. The spacecraft will measure more than 30 climate variables from its perch 512 miles (824 kilometers) above the Earth. Scientists will also use NPP to monitor natural disasters, such as volcanic eruptions, wildfires and floods. NPP will also test out technologies for an even more advanced line of Earth-observing satellites, known as the Joint Polar Satellite System, which should start coming online in 2016 or 2017. "We look forward to many, many years of great advancements of science and improvements of forecasts from the NPP mission," said Michael Freilich, director of NASA's Earth Science Division. "The measurements from NPP will be affecting everyone in this nation, and indeed perhaps in the world."